Poofy was started about 10 years ago when one of the founder’s family members was diagnosed with cancer. They set out on a mission to create a company that didn’t use the myriad of toxic chemicals that we find in our everyday bath and beauty products. 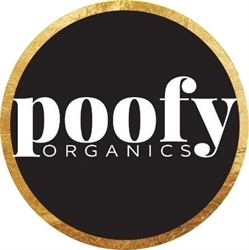 Poofy is is still a small family-run business, and they make their products in small batches to guarantee quality and freshness. Most of their products are now USDA certified Organic because they truly want to show that they offer the best that they can. Poofy Organic products are free from synthetic fragrance, parabens, triclosan, PEGs, Triethanolamine, Oxybenzone, GMOs and other harmful chemicals that have been proven to be carcinogenic but still remain in popular products sold in stores. Poofy doesn’t green-wash either! They are truly open and honest about the ingredients they use. Poofy offers products for baby, baby, cosmetics, bath, hair, home and more!